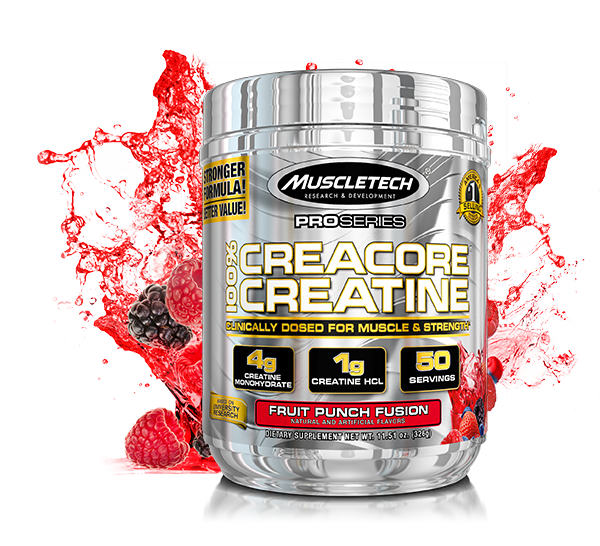 MuscleTech® Pro Series CreaCore® features multi-source creatine technology to deliver a powerful dose of two forms of superior, ultra-pure creatine. Just one scoop of CreaCore delivers a 5g dose of creatine, clinically shown in university testing to enhance muscle creatine saturation. That’s 25% more creatine per scoop than the competitor’s creatine powder! Creatine has been shown to build more muscle size, strength and performance while accelerating between-set muscle recovery. Each serving of CreaCore® delivers 4g of the most researched form of creatine available to help build more muscle strength and enhance recovery during workouts. Our creatine undergoes rigorous testing, so it’s our promise to you that it will deliver on purity, potency and effectiveness. Each serving of CreaCore® provides 1g of 100% ultra-pure, laboratory tested creatine HCl, a highly advanced and potent form of creatine. In a 10-day study conducted at Ohio State University, subjects consuming the same dose of creatine in CreaCore® increased their strength capacity on the bench press by 18.6% compared to the baseline (6,658 vs. 5,613 joules). undergoes strict quality control and is third-party tested and verified to ensure that each bottle meets the highest standards of purity, quality and consistency. You can trust that what is listed on the label is in the bottle! Mix 1 serving (1 scoop) with 8 oz. of cold water once daily. On workout days, consume immediately after your workout. As with all creatine products, maintain an adequate state of hydration during use. Read the entire label before use and follow directions provided.